THE Two Rivers Festival begins its 2013 series of concerts on Friday, February 8 with a newly-commissioned work. Captain Samuels Speaks To The Sea tells the story of American sea-captain Samuel Samuels, who sailed the transatlantic shipping lanes in the mid-19th Century. His ship Dreadnought held the record for the fastest crossing ever made between New York and Liverpool by a three-masted clipper. The concert is a setting of an original text by Peter Davison composed by Philadelphia-based Melissa Dunphy. 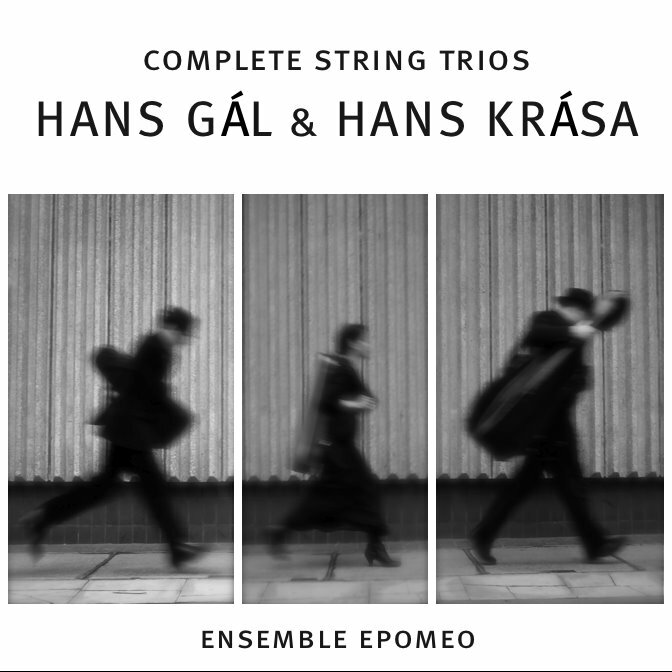 It will be performed by string trio, Ensemble Epomeo, who have received critical praise for their imaginative approach, attention to detail and passionate performances. The music is based on traditional sea shanties, and the audience will have a chance to hear original tunes sung by close-harmony group BarLine before the main performance. The work was premiered in October last year at the Custom House Maritime Museum in Newburyport, USA. Peter Davison, the festival’s artistic director, said: “This will be a unique event. Melissa Dunphy’s piece received a standing ovation at its premiere performance and many were moved to tears. The Ensemble will also perform with pianist Clare Hammond, a former Young Musician of the Year finalist, in a programme which includes works by Mahler, Beethoven and Andrew Keeling. The concert gets underway at 7.30pm on Friday, February 8. It will be performed at Bushell Hall, Birkenhead School, Beresford Road, Prenton. Tickets for the night will cost £15 or half price for under 16s. For more information about the evening telephone 651 3095. This disc of string trios presents two highly contrasted victims of Hitler. The music of Hans Gál (1890–1987), born just outside Vienna, embodies the virtues of Viennese tradition: it is elegant, cultured and effortlessly resourceful – Gál was both a natural lyricist and a natural contrapuntist, which means that his music appeals to heart and brain in equal measure. The Serenade (1932) is full of understated energy, like happy Reger; by the time of the op. 104 Trio (1971), when Gál was 81, his music is suffused by a profound and gentle wisdom; the closing set of variations is masterly. I knew Hans Gál at the end of his long life. He told me once that his parents had taken him, when he was six, to hear one of Mahler’s first performances at the Wiener Hofoper. ‘But that was 1897’, I gasped in astonishment, but he still remembered it clearly, and you have the same sense of stylistic continuity in his music. The raw energy in the two pieces by Hans Krása (1899–1944), by contrast, indicate what was lost in October 1944 when, with his fellow composer-inmates from the ghetto of Terezín, he was bundled onto a transport to Auschwitz and gassed two days later. There’s a rough-edged vitality here that reveals that the Janáček tradition, in normal circumstances, would have had lots of life in it yet. Beautiful performances from the Ensemble Epomeo. 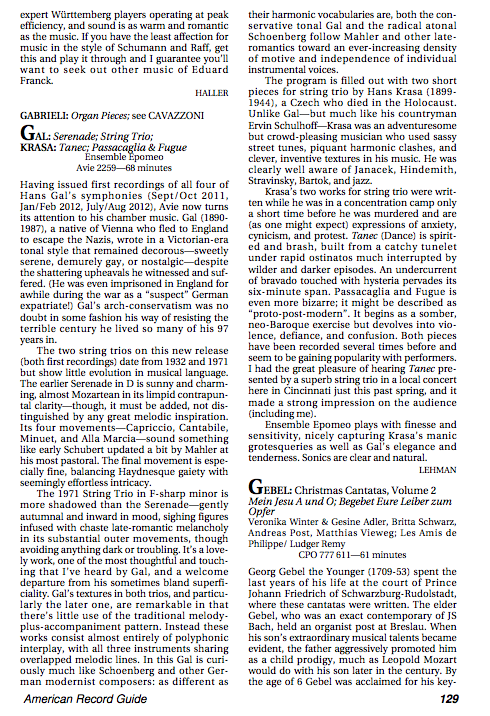 A new review from critic Gavin Dixon on the excellent Classical CD Reviews website. Music by the Theresienstadt composers comes with all sorts of historical and political baggage, and while the musical qualities of Ullmann, Krása, Klein and their colleagues are now widely appreciated, their works are usually presented together and in isolation from anything else. This approach is defensible in some musical respects, particularly through the fact that each of the composers who worked at Theresienstadt was transformed by the experience, leading them to write music they would never have contemplated on the outside. But the ghetto approach to the presentation of these works perpetuates the injustice that created it. With that in mind, it is all the more laudable that two Theresienstadt works by Hans Krása are programmed here with the Gál. The camp makes its presence felt in the terseness of Krása’s musical prose; his message is concentrated because his days are numbered. Even so, there are interesting stylistic links between the two composers. 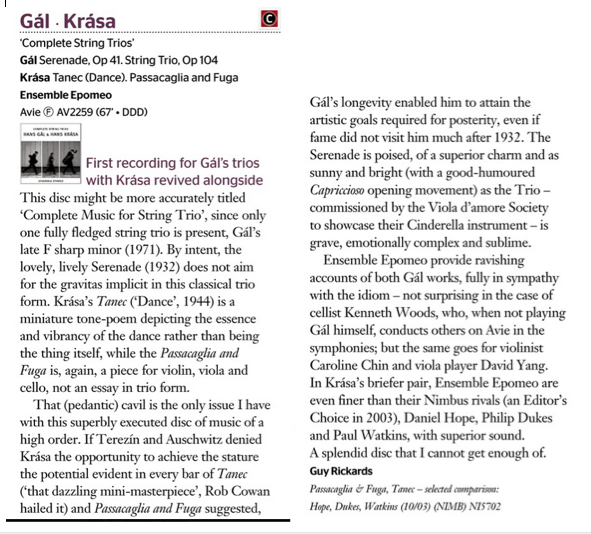 The Brahms in Krása’s music is mediated by Schoenberg, whereas Gál takes his direct. Dance forms underpin the more energetic passages in both composers’ works, but in both cases the links with any actual folk tradition are tenuous. Ensemble Epomeo does both composers a great service with their precise, lively and stylistically astute performances. The clarity in all the textures allows both men’s contrapuntal innovations to shine through. There is atmosphere here too (helped by the warm recorded sound) and the long movements of both Gál works are fabulously involving, with the ensemble leading the ear through the composers various arguments and corollaries. Nobody is suggesting that any of this music is being rediscovered or saved from terminal neglect. In fact, both composers are well represented on disc, at least in terms of the number of commercial recordings each has to his name. But the quality of these performances may help to initiate a new era in the reception of their works, and especially of Gál’s. His Serenade definitely deserves a central place in the recital repertoire, even if it requires performances of this high standard to make its many qualities fully apparent.